Every single hosting company has had an outage, a bad customer experience, or something that has gone wrong to upset a customer. It’s just the nature of the beast. Some companies are able to take their lumps and recover. For some it may become a pattern where even despite their best efforts later on they have built a negative reputation with the customer base that dogs them for years. It is not a matter of if your hosting company will have an issue negatively affecting you, but when. So as a hosting company, which we are, how do we tackle this inevitable situation? A fellow in the WordPress community runs a site called HostingReviews.io that monitors twitter sentiment for web hosts. It scores a tweet mentioning a host on positive or negative sentiment. There are no affiliate links involved, and over time he has ranked hosts based on how, via twitter at least, the host fairs in the court of public opinion. You’ll see Pagely there currently ranked 3rd. #sadpanda. As I said at the opening, sooner or later something will happen at a host that affects you, or a large number of customers, to such a degree that those customers head to twitter to reach out for support, vent, or in extreme cases curse you and all your next of kin. Shortly after hostingreviews.io started tracking our company we had that day every host fears, a widespread problem affecting a large number of users. You’ll see our trend line bottom out on October 30th, the day a legacy provider of ours had some major issues with a pair of load balancers we routed legacy customer’s through. A quick backstory: We moved all customers to our new setup at Amazon and had slowly been moving customers off the old IP blocks to the new IP blocks. When those legacy systems failed, any customer who had not moved, or been moved by us, suffered an outage that lasted several hours. Not a good day for the customer. Not a good day for us. There are also 2 negative tweets about slow response times to a support request shown on hostingreviews.io. While we are not perfect 100% of the time, we always give 120% effort. Quality and timely support is a benchmark the whole company is tasked with achieving. The more important part of the story is how as a company we recovered from a bad day. Since the Oct 30th issue we have scored well. This is good news for everyone involved customers and company alike. It shows that historically we are not repeat offenders. Winning at customer service is a multi-faceted task. It takes the entire company to do it right. – Pre-Sales and Marketing needs to be high touch and on point communicating value’s and setting proper expectations. – Onboarding needs to be easy and fluid. – Support needs to be timely and helpful. Skilled in solving the questions asked without having to pull in engineering on every request. – Engineering needs to back up Support by maintaining the quality and integrity of service and mitigating future support needs via automation or bug fixes while anticipating and addressing future crises. – Executive staff needs to set the tone, from the top down, that the customer and the customer experience, is the number one priority. If the executives focus more on revenue then customer happiness the company will never recover from a bad day. You cannot improve what you don’t track. In the past “customer service” could be considered an intangible or soft metric that is hard to quantify. This is certainly wrong in this day an age. Every customer service rep should be given the tools and tasked with following up with customers on performance. 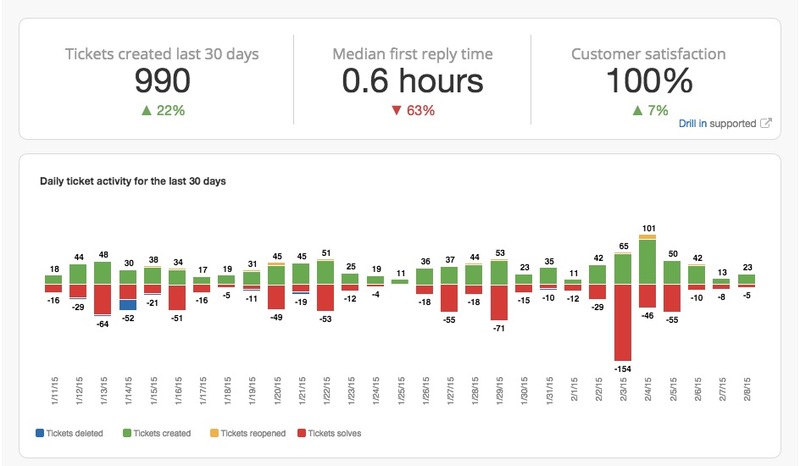 Zendesk makes it easy for our customers to rate their satisfaction with our service. It also tracks other metrics like average time to first response and more. Look into Net Promoter Scores as well. The last 30 days at Pagely we have seen an uptick in new tickets, a slight lag in response time, but a solid 100% approval rating. We were playing catch up a bit from the Christmas holiday where most of our team was on holiday. I would love to be #1 (as we were for while) on the hostingreviews.io score chart. However I am more thrilled that as a company we have set the right values, culture, and company priorities that when the bad day does come, it is just a historical dip in the chart and not the evidence of a long term pattern. Rome was not built in a day, and the rapport you build with customers is reinforced at every touch point along the way. We have found that customers tend to be more forgiving of a bad day if we have gone above and beyond for them elsewhere. At Pagely, we call it Customer Service + 1. We try to add that little something anywhere we can to the customer experience. It’s easier to ask for forgiveness from an alley then an enemy. Make your customer’s into allies.